Destroyer of worlds, wearer of insane pants. Why is Brock Lesnar wearing these pants? Because who the hell is going to tell him he can’t? The former UFC heavyweight champion appeared in a picture on the Jimmy John’s Facebook page wearing a coat, a turtleneck and one of the most ridiculous pairs of pants that exist in the universe. It’s possible Lesnar is trying to set the Guinness world record for longest fly. It must take him an extra 10 minutes at the urinal. Lesnar is just hanging out these days up in Minnesota. He hasn’t appeared on WWE television since SummerSlam, though it’s likely he’ll be brought back into the fold before Wrestlemania 30 in April. There has to be a way to get these pants into a storyline somehow. Maybe the legs can act as a hiding for a luchador tag team. 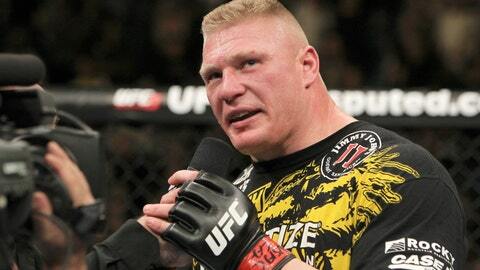 Brock, who will never return to the UFC likely because he hated getting punched in the face, might open up a Jimmy John’s franchise, according to the Facebook caption. It’ll be great for promoting their new guys-with-diverticulitis menu.